In his new LP High Hopes, Bruce Springsteen continues his role in being a recorder of the bleak and the joyous moments of life in America. Springsteen’s albums since the turn of the millennium have, for the most part, served as his own State of the Union address. From seedy, underground alleys and bars to celebrations in small towns—some of the images that fill High Hopes—Springsteen shows us his real America. 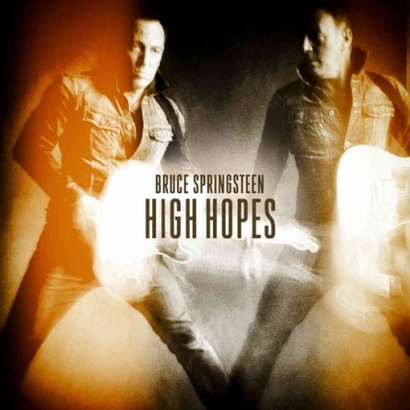 The narrative and musical threads of High Hopes sound familiar to long-time Springsteen fans, as much of the album consists of unused songs from the past twelve years of Springsteen’s recording career. In spite of this, High Hopes flows and feels like one of Springsteen’s standard studio LPs, proving his masterful skill in constructing an album. Springsteen and producer Ron Aniello take the highly differing threads of Springsteen’s recent past and weave them into a magnificent tapestry. High Hopes specifically spotlights the newest member of the band, Rage Against the Machine’s Tom Morello. Morello’s presence is unmistakable throughout the record as he uses his signature guitar power to create new dimensions in Springsteen’s already rich musical landscape. Morello also contributes vocals to the reimagining of “The Ghost of Tom Joad” which, despite being released nearly 20 years ago, still is a poignant reflection on American life. Even with the shiny new lineup, Springsteen and the E Street Band are clearly still rooted within their definitive and distinctive sound.“Frankie Fell In Love” is classic Springsteen, containing subtle harmonies from Steve Van Zandt that work in tandem with the lyrics. High Hopes confirms the vitality and relevance of Bruce Springsteen as an artist in 2014 and gives ravenous fans a great new record to keep on repeat.